I am going to preface this article by clearly stating that not all of these unique sofas would be entirely practical, but – really – that isn’t the point. These are pieces that catch the eye, and – sometimes – make the eye wonder if it really saw what it thinks it just saw. These can range in style from modern sofas, to ornate traditional sofas, to custom-crafted designs that defy categorization. A few of them are commercially available, but most are just pieces I have stumbled upon while looking for Interior Design inspiration. Either way, they are wonderful to look at… and I hope you enjoy. 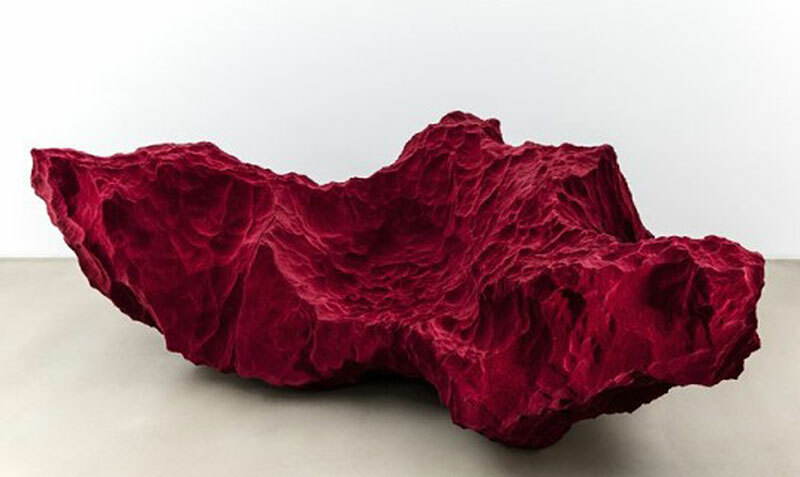 This unique sofa design from Fredrikson Stallard’s 2015 Momentum Collection uses polyurethane, glass fiber, and polyester to create a delightful structure that looks like a big hunk of uncomfortable red rock. Created for his Momentum Collection, it’s a very unique take on living room furniture that might be nicer to look at than to sit on. But who knows… foam is squishy, so looks could be deceiving. Honestly, I can’t imagine spending time on that watching TV, but I’m pretty sure that was never the intention of this unique piece. 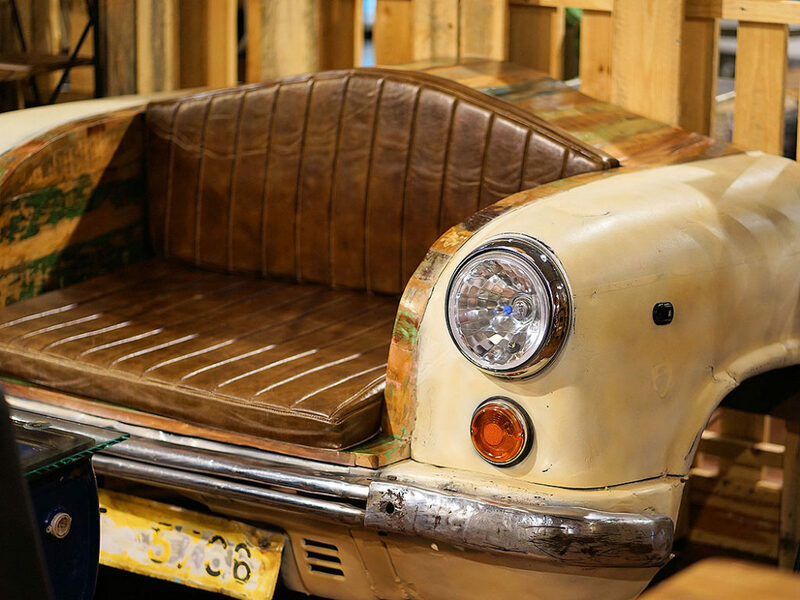 For the auto enthusiast, or those who love everything vintage, this piece has been crafted from old car parts. It’s got a really quaint charm to it that I could easily see in a fun living room or den. Plus, it has Man Cave written all over it. In fact, I think that might be what the licence plate says. Once again, more for visual appeal than practicality. But, if all you’re after is comfort… then you might as well go for a good old La-z-Boy recliner. If you love video games, you’re going to LOVE our next entry. 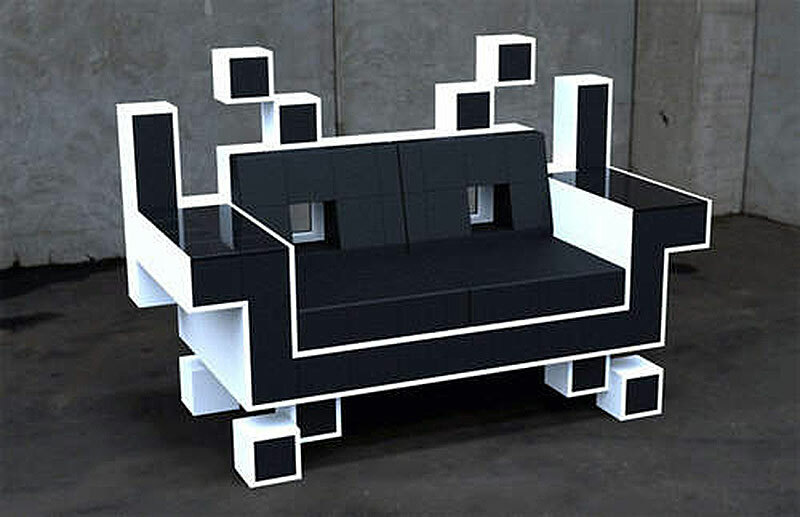 This sofa pays homage to the classic video game Space Invaders. I actually could see this being put to use in a games room. It might not be super comfortable for hours and hours of gaming, but the look is worth the trade-off. 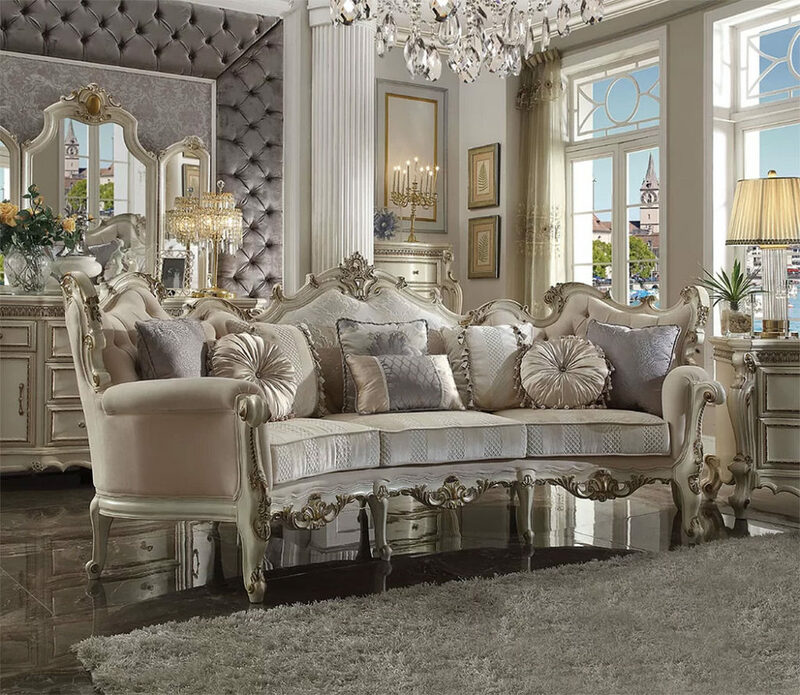 And now for something completely different, this incredibly ornate sofa looks like it belongs in a palace or manor home. This unique sofa is intended to impress your guests while you serve them really expensive tea and some sort of fancy biscuits. You do not… I repeat… You do NOT put your feet up on this sofa! I feel like if you sat down on that sofa wearing jeans, you would instantly be ejected via some sort of hidden internal mechanism. From the pristine palace, we move to the Hollywood Boudoir. 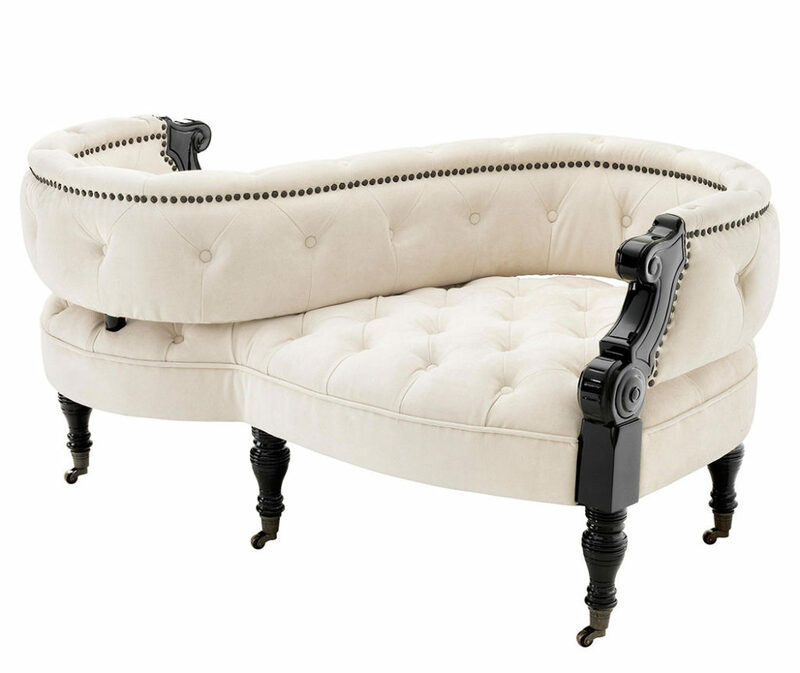 There is something sumptuous about this Gaby French Country Sofa, like forbidden love that must sit mere inches away. 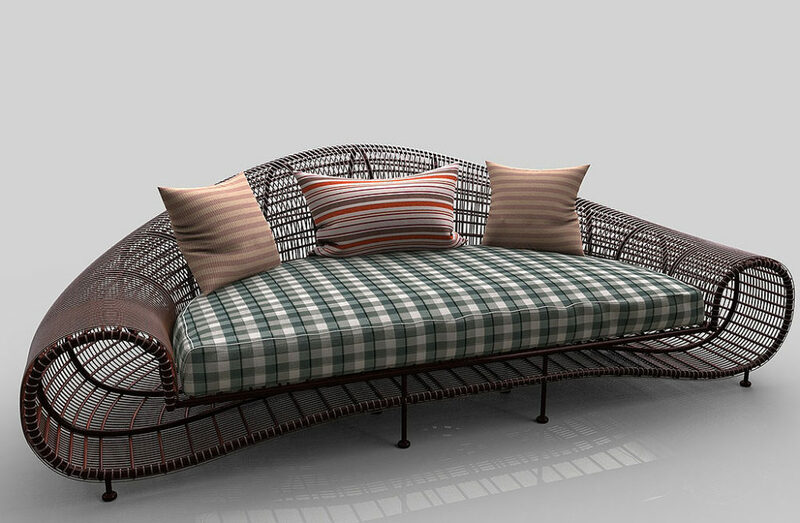 The COOLEST Outdoor Sofa… Ever! Yes, this is an outdoor sofa. Yes, I would probably still use it in my home. It is THAT cool. Granted, I would probably replace the cushions, because outdoor upholstery isn’t quite as cozy for indoor seating. Plus, although I LOVE the Sofa, I don’t LOVE the green plaid. But maybe that’s just me. This one I could easily see in day-to-day use in your above-average home. The structure of the sofa itself isn’t terribly unique, but I love the patchwork upholstery that gives this piece a gypsy-like flavor. And I don’t think this sofa would judge you if you were wearing Jeans (or nothing at all) when you sat down on it. Granted, I might judge you if you tried to sit on my couch naked, but – again – that’s probably just me. 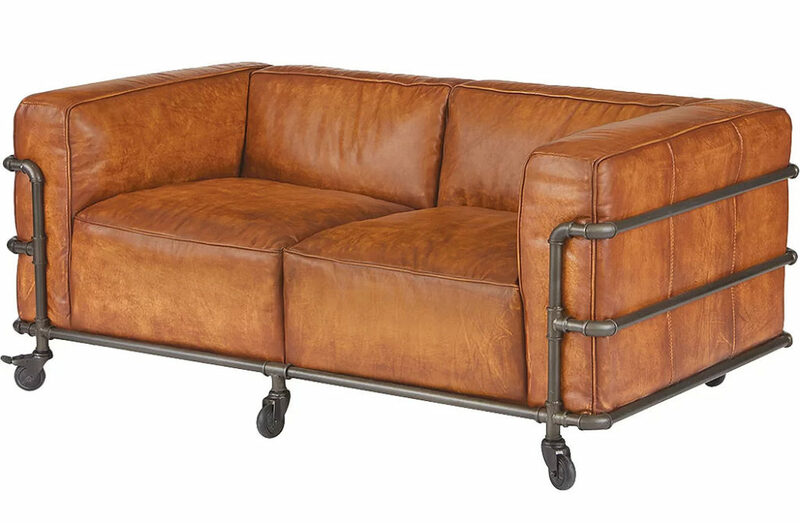 For those who love the Industrial Loft look, this unique Georgette Leather Loveseat from Wayfair uses a combination of industrial-style pipe framing and warm, brown leather to create the perfect loft sofa… on WHEELS! 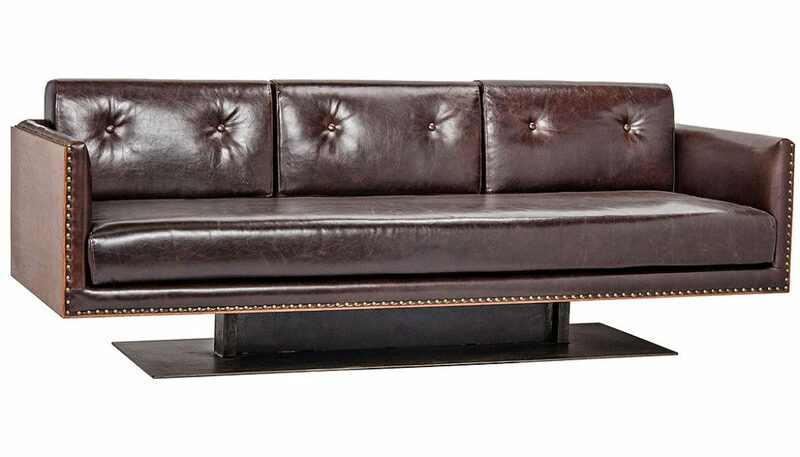 Trent Austin Design, the makers of this unique sofa, is known for fusing rustic detailing and industrial inspiration with modern silhouettes. This loveseat practically screams “Sit on me with Jeans!” And, did I mention that it’s ON WHEELS!!! That’s not actually the name of this particular piece of furniture. The manufactures and retailers call it the Aliyah Loveseat, but there’s something about the color and the shaping that make it feel like it should be called The Pumpkin Spice Latte Loveseat. This loveseat is decorated with ball arm support and roller-shape feet, and is wrapped finest genuine Italian leather combined with skillfully matched leatherette on the back and where contact is minimal. The eggs on the floor are just for decoration and are not included. Sorry about that. 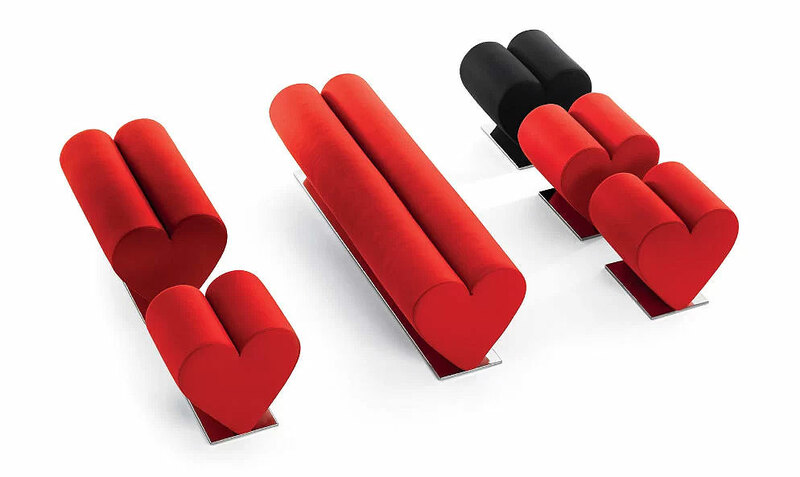 If you love love, and you love the fact that you love love, and you want to show everyone how much you love the fact that you love love… this is the LOVEseat for you. Or the LOVEchair. Or the LOVEsofa. Your choice! As uncomfortable looking as a bad blind date, these unique pieces of furniture – like so many of my past relationships – offer nothing in the way of proper support (emotional or otherwise). But they look – what’s the word – Lovely??? 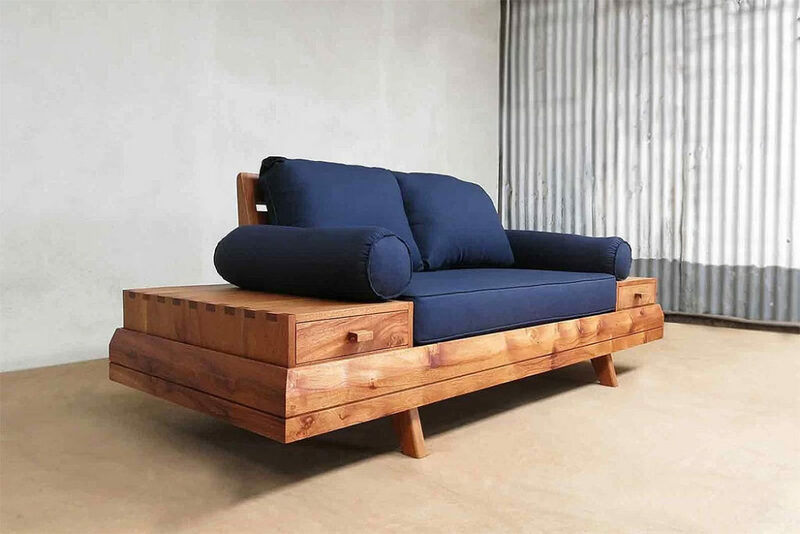 From Masaya & Co comes this unique rustic sofa that floats on a bed of rough-hewn wood. This particular sofa is unique not just because of its original design, but because of the sustainable manufacturing process used in creating each piece of furniture. Dedicated to design & sustainability, Masaya & Company began as a reforestation project in 2007 when it started planting trees on previously clear cut land in Central America. All of the tropical hardwoods used in Masaya & Co. furniture is either sustainably harvested from their tree plantations or recovered from areas damaged by hurricanes. Masaya & Co pledges to plant 100 trees for every piece of furniture sold. 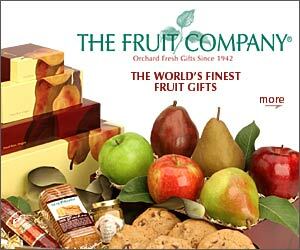 To date, Masaya & Co. has planted over 700,000 trees on over 1200 acres of land. Wow, I feel like I suddenly got serious for a moment. Trees that can that to me. 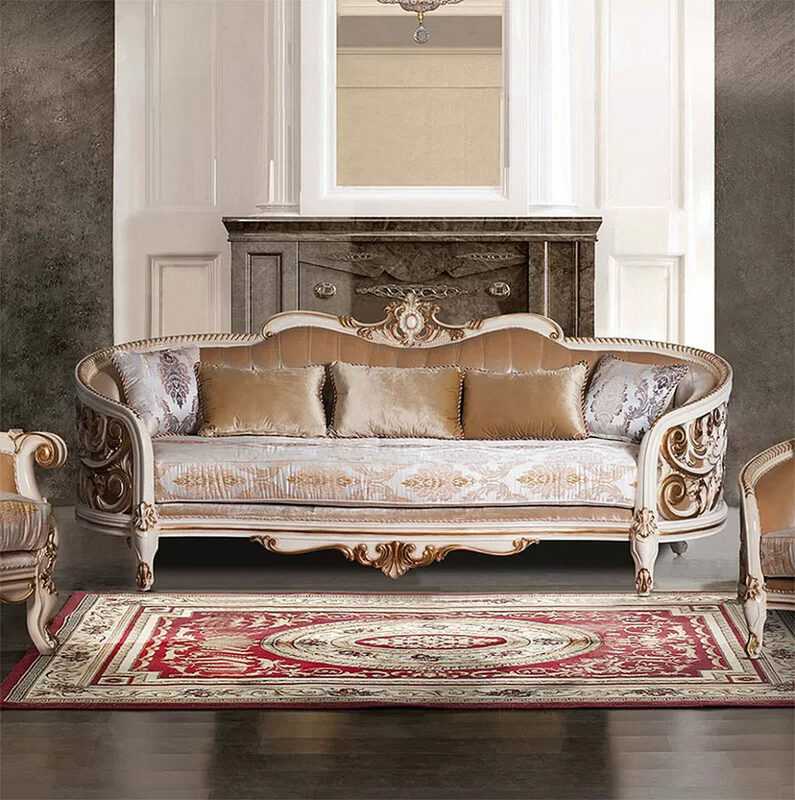 This European-style sofa brings the influence of European antiques to life with traditional carvings, detailed looping, and gorgeous antique pearl finish. This particular sofa falls into the Fancy-Pants collection, because you don’t put a sofa with this level of hand applied finish & detailed woodwork and carvings into the Man-Cave. You just don’t. If none of the sofas above really speak to you (not that Sofas usually speak), you can create your OWN sofa with this unique modular sofa. This DIY sofa is configurable so that you can create seating for any space and occasion. Unexpected company? Change up the Sofa! Relatives you don’t really like coming to your house over the holidays? Change up the Sofa! Having a rough day and need something distract yourself from how terrible life can be sometimes? Change up the Sofa!! 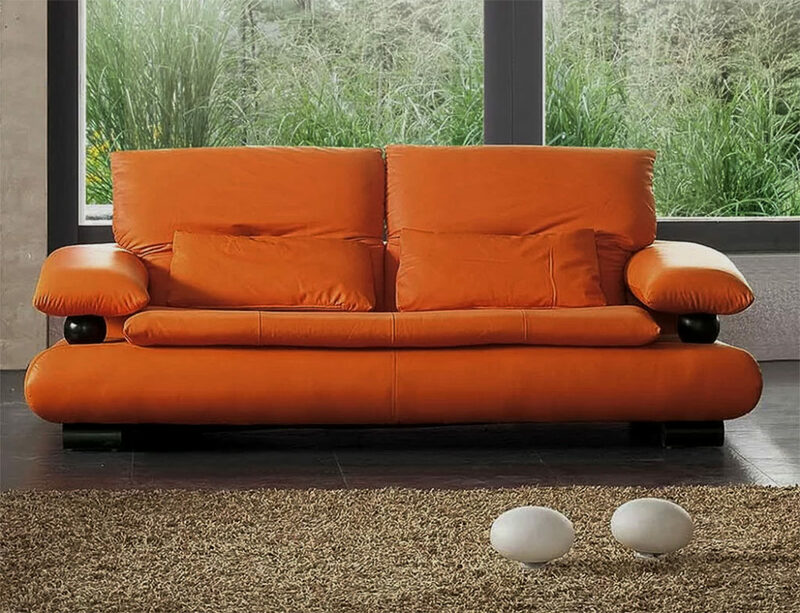 If you don’t like legs… Chicken legs, Frog legs, or Sofa legs… we’ve found the floating pedestal sofa for you. For more than ten years, Noir has been designing, building and importing their very unique, but ever growing collection of home furnishings. 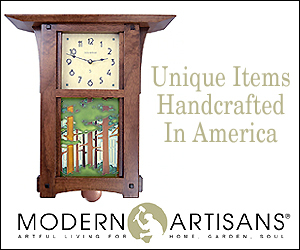 They emphasize natural, simple and classic designs and do their best to be an environmentally friendly manufacturer. And, apparently, they don’t like furniture legs. This is not necessarily a bad thing… I dare you to try to stub your toe on this sofa. I double-dog-dare you! 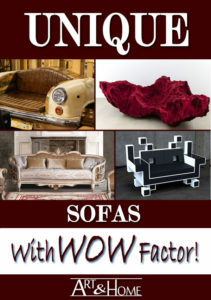 You may like some of these unique sofas. 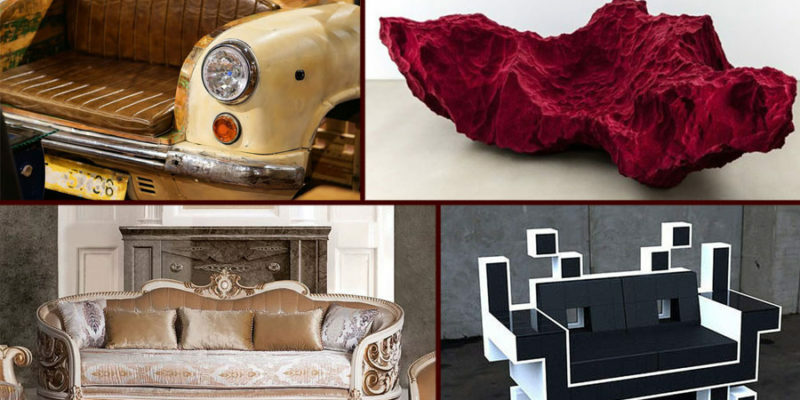 You may love some of these unique sofas. 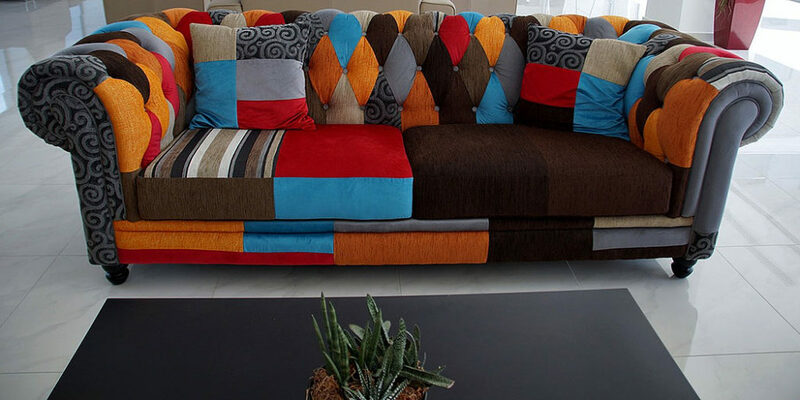 You may hate some of these unique sofas. I never promised that WOW was always going to be a good thing.